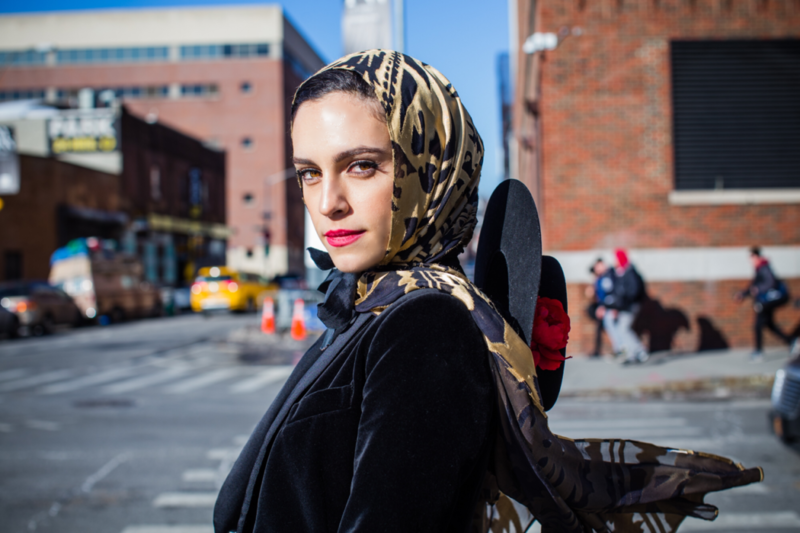 Disclaimer: This is in not a piece relating to how to wear a headscarf in a religious context, but instead relating to wearing a headscarf with fashion considered. One of the most frequent questions I receive on social media is “where do you buy your headscarves?” and “how do you style it?”. For those who already wear a headscarf, religiously or for fashion, this may seem like a ridiculous question. Considering headscarves were one of the biggest trends on the runway during fashion month in February, I thought it would be useful to share my seasonal favorites and some useful tips headscarf styling, along with all the places I shop for scarves. The three things to consider when choosing a headscarf for me is texture, shape (square or rectangle/wrap) and color. Just because a scarf is the wrong shape, doesn’t mean you can’t wear it. Buy the scarf and have it altered. If the scarf is big like a blanket, have it shortened. If it is a square and you only wear a rectangle scarf, if it is large enough, you can still rock it like a wrap. If the edges are frayed, just hem one side! It just requires creative styling. This is true of wraps as well, cut that wrap into a square! Instead of using pins that can ruin your scarf, try using hijab magnets. This has been a life-changing for the way I style my scarves. It has saved lots of my silk and satin scarves from being destroyed by pins and keeps the scarf in place without being tight on the chin. Since I received these from Haute Hijab, I have been addicted! Find the style that fits your face shape. Haute Hijab not only has a useful guide to headscarf styles, but suggests styles based on your face shape. Keep in mind that certain fabrics can also change the way your face looks in a headscarf! One can never have too many scarves. I do not generally shop at brands that only sell hijabs, though I am very much a recent fan of the brand Haute Hijab because of their quality and diverse selection. Besides that, I shop at department stores and boutiques. I dress a scarf like I would a blouse, skirt etc. I consider the nuances in the fabric, color, and style, all which can change how it compliments a whole look. I try to buy a wide array of colors and fabrics as a result. Silk, satin, chiffon, modal and viscose are all the fabrics I wear as I try to avoid linen and thicker fabrics that not only wont fold to frame my face but become too warm. Since I consider myself as a woman who wears a headscarf for religious purposes, I invest in many high end scarves as well. Wearing a headscarf everyday, you get a lot of wear out of the scarf and it is a wardrobe staple that is not something that can go out of style. It is a life-long investment. I do not just build my wardrobe with clothing, I build my scarf collection as well. With that said, I love to splurge on designer scarves. Scarves are the crown on my head, money is no object.